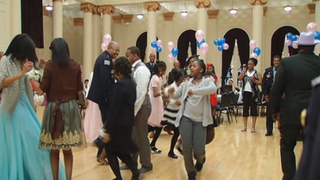 On May 22, 2015, the Chicago Police Department held its first daddy-daughter dance. As it now stands, police departments and the black community may as well be on polar opposite ends of the spectrum when it comes to building an effective relationship against the backdrop of the #BlackLivesMatter movement. But that didn’t stop the Chicago Police Department from trying. On Friday it held its first “Daddy Daughter Dance” to celebrate fathers and their daughters, NBC Chicago reports. And for a dozen or so girls whose fathers weren’t available, police commanders, sergeants and officers gladly stepped in. Three different Chicago police districts and the National Organization of Black Law Enforcement Executives organized the event, which was held at the South Shore Cultural Center. The hope is that the event can become an annual happening. According to the news station, the free formal event had girls of all ages dressed in their Sunday best as they danced the evening away. For many of the officers, this was an opportunity to connect with the community on a personal level. “They actually get to see us to find out that that the police are nothing but people. We just happen to have uniforms on,” Cmdr. Larry Watson told NBC Chicago.